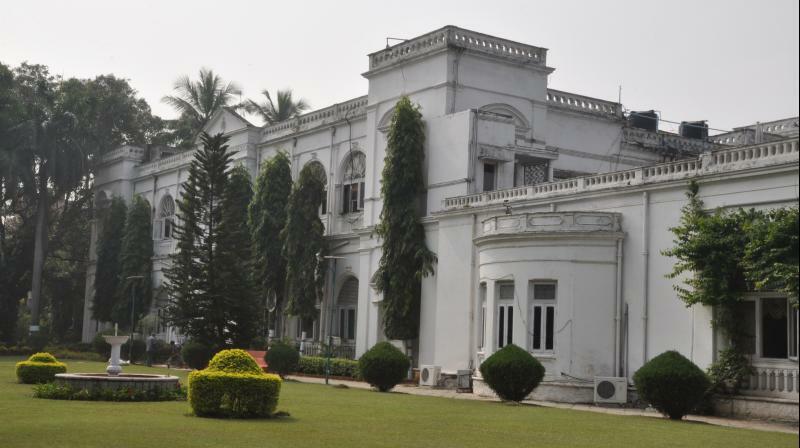 The 111-year old palace that houses the Administra-tive Staff College of India, has a very interesting past. Bella Vista on the junction of the roads leading to Raj Bhavan and Panjagutta was built by Muslehuddin Mohammed who was given the title of Hakim-ud-Dowla when he was the chief justice. Hyderabad: Bella Vista (beautiful sight in French), the 111-year old palace that houses the Administra-tive Staff College of India, has a very interesting past. Built in 1905 on 9.5 acres in Indo-European style by Muslehuddin Mohammed, the palace at that time overlooked the Hussainsagar and is located on the junction of the roads leading to Raj Bhavan and Punjagutta. Muslehuddin Mohammed, bar-at-law, became Chief Justice of the High Court of Hyderabad and was given the title Hakim-ud-Dowla. He lived there from 1905 to 1914 when he fell victim to plague at the age of 57. On his death in 1916, the family decided to sell the palace. The Nizam purchased it, along with furniture, for Rs 60,000 in 1917. Sir Ali Imam, who served as the Prime Minister of Hyderabad in 1919, occupied the palace and used the building next door “Lake View” guesthouse as his office. In 1922, it was renovated and became the official residence of the Prince of Berar Azam Jah. The palace witnessed dramatic events that typified the royalty of yore — luxuries with “women swarming all around”, intrigues, failed coups, shattered dreams and a disgusted princess leaving the palace in a huff with her children in tow to England, according to ASCI records. When Azam Jah occupied the refurbished building, it had two tennis courts, a regular swimming pool for his wife Princess Durru-shehvar and a “baby pool” for the Prince who had phobia for water! While the pool and tennis courts remain intact, the baby pool made way for a library. Hostel buildings have come up a little away from the main building. The Intach heritage award-winning two-storey building has semi-circular arches in perfect proportions. The interiors are still intact. It has parquet flooring in its major halls, which was earlier used as dance floors. One of them is now used as a dining hall and another, a lecture hall. The building, without any columns, stood on two-feet thick walls. Another interesting feature of the campus is the air raid shelter with an underground passage from the Prince’s room to the exit gate. Photographs taken by Raja Deen Dayal adorn the corridors. Mohammed Ali Jinnah, the founder of Pakistan once visited the palace. “It’s a magnificent palace. I came for training during 1956-57 when I was posted at Vizag. There were spicy stories of the bygone era. The staff wore Nizam insignia,” Mr Narendra Luther, former IAS officer and historian told DC. “Azam Jah got a monthly allowance of Rs 25,000 but his lavish life landed him in debts. He was eager to succeed the Nizam, and was frustrated as he couldn’t,” Mr Luther said. He is rumoured to have resorted to even black magic against the Nizam. Osman Ali Khan was upset. In 1964, when the Nizam fell ill, Azam Jah wrote to the Government of India to declare him the Nizam. Osman Ali Khan was furious and nominated his grandson Prince Muk-arram Jah as his heir. After integration of Hyderabad with India in 1948, Azam Jah vacated the palace and it was converted into State Guest House in 1956. ASCI provides the best Hyderabadi and continental dishes even today. It prepares its own bread, biscuits and ice creams. And it is the only administrative college with a bar attached.